One of my favorite Long Island wedding celebration venues has got to be the Royalton Mansion at Roslyn Country Club in Nassau County, New York. This place has it all...amazing food, impeccable service and all of the elegant architecture to make it a wedding photographer’s paradise. 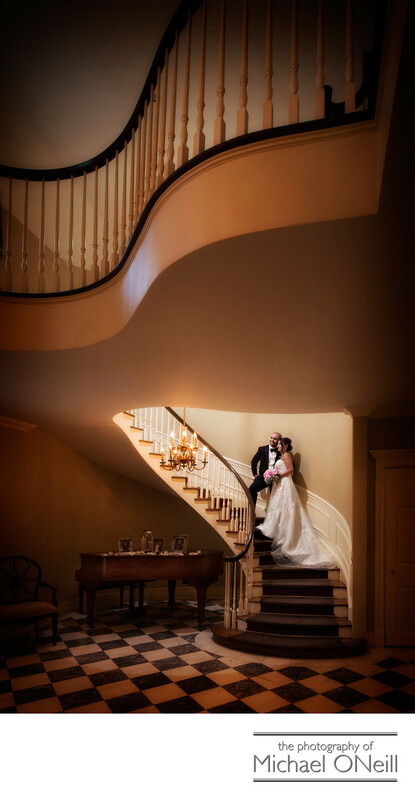 The crown jewel of it’s interior is this beautiful spiral staircase that leads from the lobby to the expansive upstairs bridal suite. The railings on the balcony above the lobby are set in a curved array to compliment the curve of the staircase itself. By using an extremely wide angle lens on the camera, and positioning myself and the bride and groom in just the right juxtaposition, I was able to capture all of the elegance of the amazing main lobby at The Royalton. Accomplished wedding photographers carry every conceivable piece of equipment that they may need to use at any given location to create awesome wedding photos. The very expensive wide angle lens that was used to create this image is a perfect case in point. It has virtually no use in any wedding environment, unless that environment has an architectural element like this. Then it becomes an indispensable creative tool. Is it a luxury to own such an expensive piece of equipment for rare use? Yes, but in an environment like this it is priceless.